On Monday May 14, 2001, The U.S. Supreme Court issued its ruling on the U.S. vs. Oakland Cannabis Buyer's Cooperative. The Court's 8-0 decision that there is no "medical necessity" exception to the nation's drug laws that allows the distribution of medicinal cannabis marked a perfect trifecta for Jacki. She has now been screwed over by all three branches of government: executive, legislative and judicial. "I'm just so angry, I'm almost shaking. I feel I've had my wheelchair kicked out from under me," said Rickert, executive director of the group, "Is My Medicine Legal Yet?" Wisconsin State Journal 15 May 2001. It was the executive branch through the Dept. 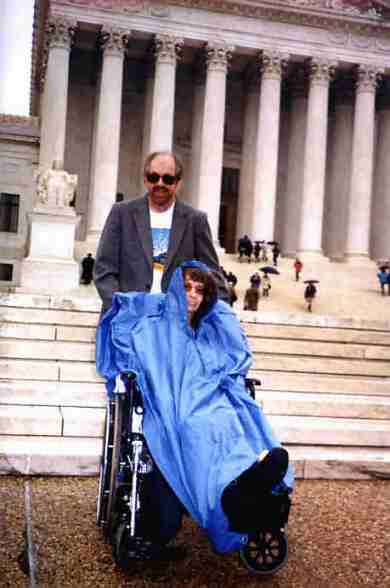 of Health & Human services that agreed to supply Jacki with supplies of federal pot through both its Compassionate and Research Investigative New Drug programs in 1990, and then reneged in 1992. Again, the executive branch, in the form of then-candidate Bill Clinton who made a campaign trail promise to Jacki in 1992 to reopen the closed IND program, if elected, And it was the Clinton Administration that launched a vicious war on medicinal cannabis patients and the state initiatives that legalized medical use in 8 states. Once again, it was the Clinton Administration that requested the Supreme Court issue an emergency stay of the lower court order allowing the distribution of cannabis to seriously ill patients in California which set the stage for the Court's ruling issued on May 14. The legislative branch got their punches in at both the state and federal levels, by not passing laws making a compassionate exception to patients who can benefit from therapeutic cannabis, along with Congress' passing of the horrendous "Sense of Congress" H. Res. 117 on September 15, 1998 at 7:29 PM, on a 310-93 vote, which stated that cannabis "is a dangerous and addictive drug and should not be legalized for medicinal use." H. Res. 117 was cited by federal attorneys in their arguments to the Supreme Court. Jacki did an interview with the Wisconsin State Journal that became part of a front page article that was picked up by the Associated Press and appeared in the Minneapolis Star-Tribune and other publications. The article was also used in radio reports about the Court's action in the Eau Claire/Mondovi area. Gary, IMMLY's Director of Communications, read a statement penned by Jacki on Kathleen Dunn's show on Wisconsin Public Radio Tuesday May 15, 2001, which appears below. Portions of the article also were used in an editorial in the Eau Claire Leader-Telegram on May 17. Links to the articles can be found below. "Anyone who would kick and/or pull a wheelchair out from under a person reminds me of someone who would pull the wings off a butterfly just to see how it feels. It makes one wonder what went through Hitler’s mind as millions died, simply because of his haunting decisions to detach himself from reality and humanity as he was considered the supreme law not so long ago. I would rather crawl with humanity and truth than run with lies and blood on my conscience." Eau Claire Leader-Telegram Editorial: : What's So Awful About Pot For The Gravely Ill? "I'm not willing to die; I'm not going to stand for it," said an emotional McClary, adding that the Supreme Court had "American human blood on their hands." -- Angel McClary, OCBC medical necessity patient who suffers from an inoperable brain tumor, anorexia and a seizure disorder, as quoted in news articles, 14 May 2001. "There are enormously effective tools available today. Smoking a joint is no more effective than downing two glasses of vodka on dealing with pain. You're drunk and you're still in pain." -- ex-drug czar Barry McCaffrey, speaking on NBC Nightly News 14 May 2001. "There's one tiny bit of good news in this week's unanimous Supreme Court decision against medical marijuana. You can't blame it on George W. Bush. You have to lay blame for this one squarely where it belongs: on Bill Clinton and Barry McCaffrey, his heartless, overzealous drug czar. " 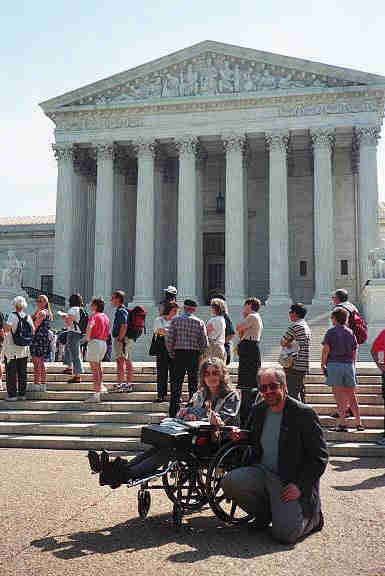 -- Bill Press, Source: CNN, Supreme Court Tramples on Grass, May 17, 2001. Search the Media Awareness Project (MAP) for news articles about the OCBC and the case. Legal Documents from United States of America V. Oakland Cannabis Buyers' Cooperative and Jeffrey Jones. Mirror site for US v. OCBC documents.